Helped by capacity increases and lowered fares, Ukraine International Airlines (UIA), the country’s flag carrier, increased its passenger traffic by 15 per cent last year, carrying more than eight million passengers. Following its strategy to develop as a network carrier, UIA’s share of transfer passengers on scheduled flights amounted to 53 per cent, down from 2017 by only one percentage point. UIA maintained its dominant position in the Ukrainian market last year with an overall share of 64 per cent, given that all 20 Ukrainian passenger carriers collectively served a total of 12.5 million passengers (18 per cent up year-on-year), a new country record, according to figures provided by the Ukrainian Ministry of Infrastructure. During the period, Ukraine International operated 61,500 flights, nine per cent more than 2017, whilst enjoying an average load factor of 81 per cent. In 2018, UIA’s mail and cargo business reached 21,348 tonnes, an increase of 12 per cent on 2017. In 2018 the airline expanded its international flight network by launching scheduled services from Kyiv Boryspil, its base airport, to Copenhagen, Cairo, Delhi and Toronto. UIA’s domestic network also increased to include Kyiv-Vinnytsia flights. Ukraine International has meanwhile continued with its progressive fleet renewal and capacity extension programme, by taking delivery of seven aircraft last year: three long-haul Boeing 777-200ERs and four new Boeing 737-800s, three of which arrived directly from the manufacturer. At the same time, all remaining seven B737-300s and -500s were phased out as the airline bade farewell to its last medium-haul classic generation aircraft. In general, the airline adopted a cautious approach to growing its fleet last year – the original intention was to add 12 aircraft: four Boeing 777s, six Boeing 737-800s and two Embraer E190s. Notably, the airline introduced a new type of wide-body, long haul aircraft to the Ukrainian market – the Boeing 777-200ER – which now operates UIA’s flights to New York, Beijing and Bangkok. The company is currently still utilising classic generation Boeing 767-300ER wide-body aircraft that are due to be decommissioned in 2019-2020. 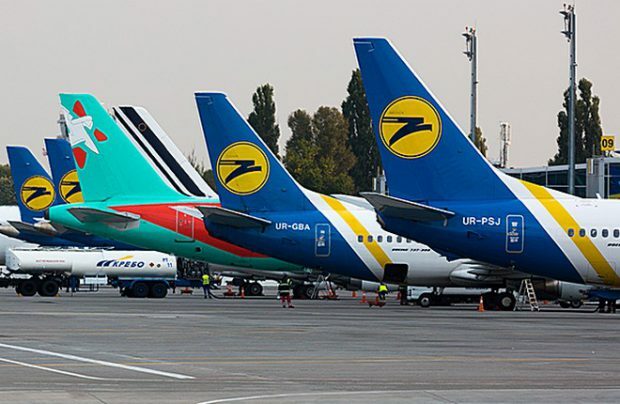 These fleet additions and subtractions mean that the total number of aircraft in Ukraine International’s fleet remains unchanged at 42 units, consisting of three B777-200ERs, four B767-300ERs, 26 B737-800s, four B737-900s and five medium-haul Embraer-190s. “In 2018, UIA continued to follow its strategy and develop as a network carrier,” confirms Evgeniya Satska, UIA’s communications director. “Long haul route network expansion as well as the wide-body fleet extensions have allowed us to take one more step to increasing our transit traffic via Ukraine whilst also enjoying further hub development at Boryspil International Airport,” she adds. The next step towards UIA’s medium haul fleet renewal will be the arrival of three newest-generation Boeing 737 MAXs, with deliveries planned for the beginning of the Spring season this year. By 2021, UIA plans to actively enhance and renew its fleet, expand its eastern and south-eastern route networks, increase frequencies of westbound flights, whilst further developing the transit potential of Kiev’s Boryspil airport and at the regional hubs in the major cities of Ukraine.